Life isn’t fair. The truth is complicated. The law isn’t always just. These seem like hard lessons to pack into a story for young adults but Daniel Handler pulled it off in his Series of Unfortunate Events. Now Handler’s quirky steampunk world has been fully brought to life with the help of Netflix. The third and final season of the show was released in January to much critical acclaim. The first two seasons introduced us to Violet (Malina Weissman), Klaus (Louis Hynes), and Sunny Baudelaire (Presley Smith), who were orphaned when their parents died in a fire that destroyed their childhood home. 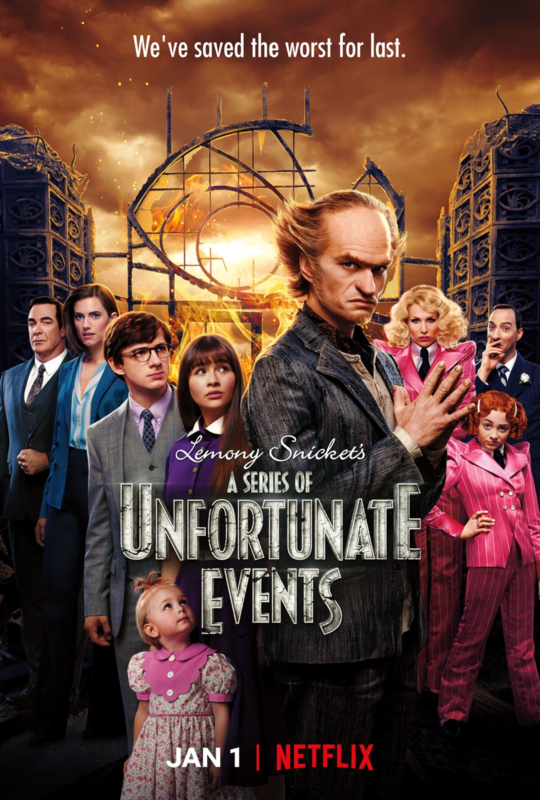 Since then, they have been on the run from Count Olaf (Neil Patrick Harris) who hunts them down in an attempt to get his villainous hands on their fortune as they travel from one incompetent guardian to another. But season three is where the series truly sets itself apart. Up to this point the three children are presented as innocent, well-educated, and respectful unfortunates adrift in a corrupt, stupid, and insolent world. But now the trio are incited to fight back against injustice and villainy. However, their new found agency brings with it a whole host of complications when they are pushed to the point of using disguises, lying, and breaking the law in order to protect themselves and bring Olaf to justice. The ethical nature of their choices is under constant debate, and the children’s moral spectrum takes on shades of gray. Warning, there are season 3 spoilers ahead. Their struggle comes to a head in the “Penultimate Peril Parts 1 and 2,” when the children are finally able to present a record of their wrongs in court. But if you think that any type of happy ending is waiting just around the corner, think again. Near the end of the trial Violet exclaims, “The law isn’t always just -- isn’t always good!” This is more than her frustration at an unfair ruling. It is an indictment of a system that has failed to provide for or protect the orphans time and again and has even allowed itself to be infiltrated by those who would abuse its power for selfish gain. constant advice to find something— anything— else to watch because things just get more complicated as the orphans set out to sea. The growing list of mysteries and unanswered questions may frustrate some, but instead of it being a sign of a storyteller who can’t resolve a plot, it is a sign Handler’s unique genius. Life is full of mysteries and looking into them often generates more questions than answers. Every potential end point turns into a new beginning. Season three currently has a 100% rating on the media review aggregator Rotten Tomatoes, and the previous two are at 94%. Samantha Nelson of “The Verge” called the series a “masterclass in how to build a faithful adaptation.” Neil Patrick Harris has received special acclaim in his role as Count Olaf as has Patrick Warburton for his role as the fourth wall-breaking narrator, Lemony Snicket.